There's plenty of concession items at the Masters, but some are better than others. March Madness! Masters office pools! All this bracketology is making us hungry. Question at hand: In a Sweet (or is it Salty?) 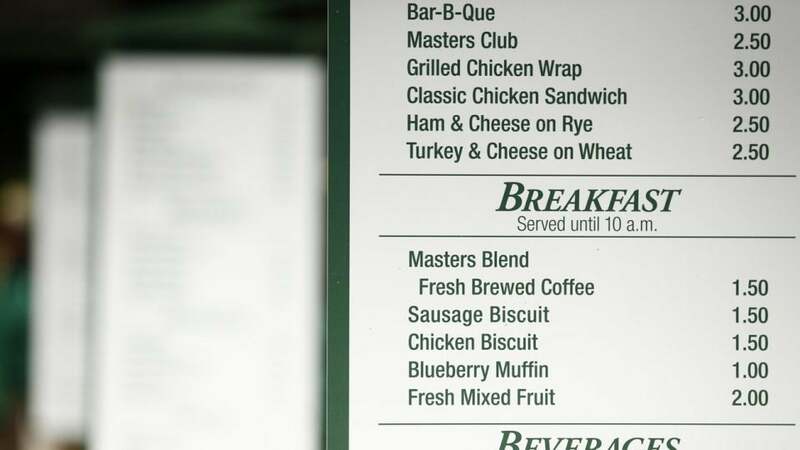 16 showdown of famously affordable Masters concessions, which menu item would come out on top? Our winning bracket is filled out below. 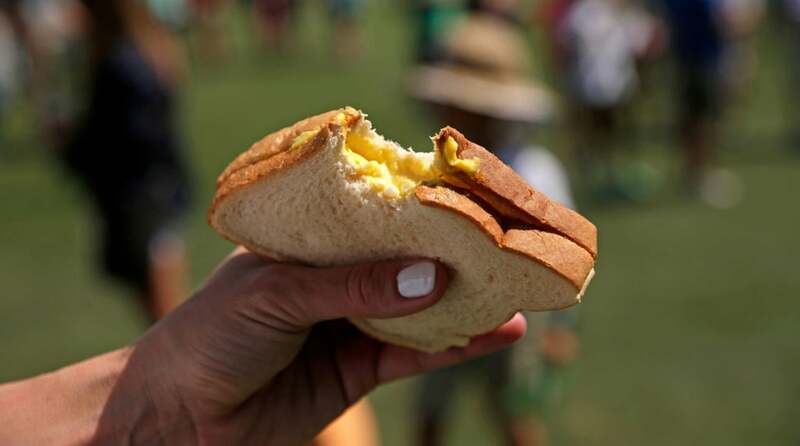 The egg salad sandwich is a fan favorite at the Masters. Let’s see. A ho-hum healthy snack or a rib-sticking Southern staple? It’s the culinary equivalent of Duke vs. Iona. What’s true of golf swings is also true of golf grub: the simpler, the better. With its mix of deli meats, the club has too many moving parts to keep pace with its straightforward competition. You know how the best barbecue is fork-tender and flavorful, with a perfect balance of smoke and spice? Well, this isn’t it. In what ranks as one of the most astounding performances ever on these hallowed grounds, GOLF.com’s Sean Zak once consumed 21 chicken sandwiches in the course of a single Masters week. He was onto something. Is this an upset in the making? No. It is not. Like a Jim Nantz voice-over, the peach ice cream sandwich is far too sugary to indulge in every day. But what a treat when it’s only once a year! The chicken biscuit is a breakfast item, which means it’s only available until 10 a.m. We suggest you show up early. Otherwise, you might get stuck with the turkey and cheese on wheat. Close your eyes and let your imagination run wild as you bite into this blueberry muffin. It’s as if you’ve just inhaled a mouthful of bunker sand. 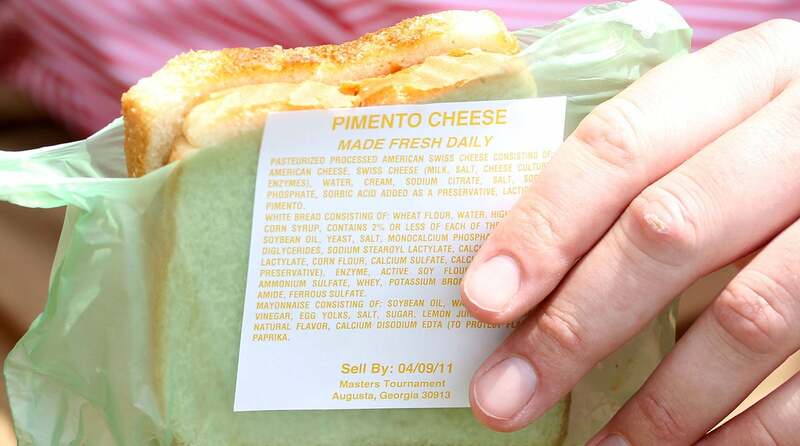 The famous Pimento cheese sandwich at Augusta National. The Zach Johnson of sandwiches, the pimento cheese is more steady than it is spectacular. It also happens to be sneaky good. The chips are kettle chips, crispy and addictive. But they’re still chips, which means that they’re a side dish, and no match for a sandwich that is practically a meal. In the wrong hands, egg salad can go sideways quickly, resulting in either a bone-dry sandwich or soppy, mayo-laden mess. Kudos to Augusta’s concessionaires for getting this egg salad right. Lard? Butter? Some combo of the two? Whatever it is they’re putting in these biscuits, it should be illegal. In the meantime, we’ll take three. 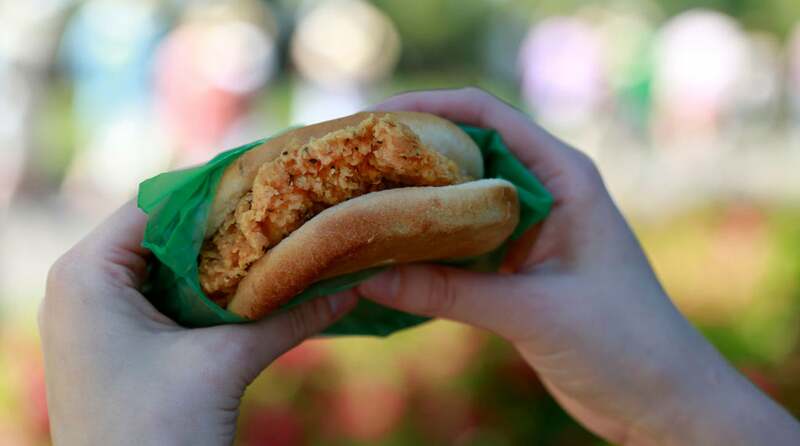 The chicken sandwich at Augusta National is hard to resist. We crunched the numbers and confirmed that neither of these sandwiches will supply you with your daily recommended amount of fiber. But if we’re going by texture and depth of flavor, the classic chicken sandwich has the edge. After a pair of upset wins, the chicken biscuit’s Cinderella run comes to an end here in the semi-finals against a sandwich of plain, old-fashioned, starchy, satisfying goodness. At last, an answer to the age-old question. Which came first? In this all-important contest, the egg.